PostgreSQL performance assessment and analysis is considered to be a required measure to spot DBMS functionality weak points that cause operating problems. 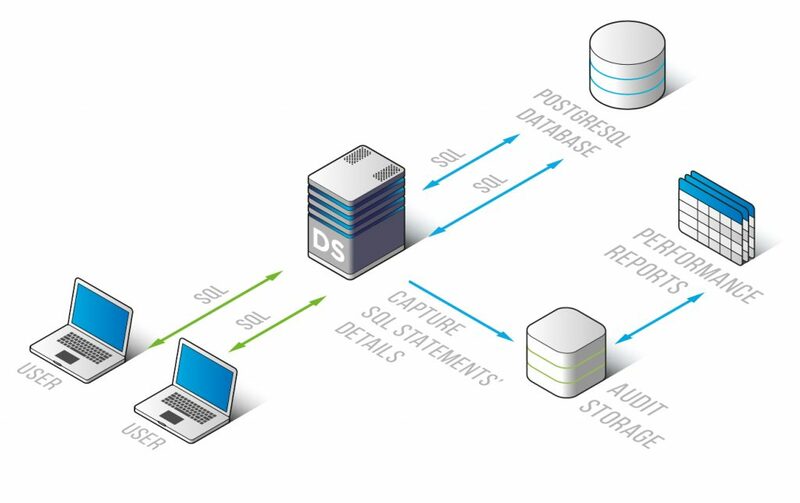 DataSunrise Database Performance Monitoring Tools are effectively useful to keep PostgreSQL processes under systematic review, identify bottlenecks or any disruptions during database operation. DataSunrise Database Performance Monitoring for PostgreSQL is an efficient mechanism for getting maximum performance overview with minimum wasted effort or expense. All DBMS processes are easily and accurately tracked and assessed in case of any obstacle to PostgreSQL functionality. When your database encounters problems related to its performance, your analysis to detect what affects DBMS operation may be simplified by looking through logs generated by the DataSunrise software product. You may get the list of SQL commands, evaluate executed queries, examine initiated scripts, assess operating delay causes, i.e. clearly visualize what may influence PostgreSQL processes and to what extent, how these disruptions can be eliminated. Redundant and unexpected queries can be identified after having analyzed queries logged by DataSunrise. The product also provides with a query result log that is helpful in detecting vulnerabilities. Queries are indicated in accordance with their types (INSERT/UPDATE/DELETE/SELECT) and their execution frequency. It is possible to see row number in INSERT/UPDATE/DELETE/SELECT operations as well as diagrams illustrating their change dynamics. Data provided by the software product also includes an indication of time required for each query, number of operations executed per second, a volume of data that has been transmitted and received by a server, as well as other information directly referred to PostgreSQL performance. At the first sign of malfunction, DataSunrise Database Performance Monitoring Tools will considerably facilitate DBMS functionality examination, point out pitfalls that cause errors with no additional tools required.